JUSTICE DENIED(50 minutes/l995) On the 28th July 1993 Joy Gardner died when police and deportation officers used force to restrain her, tying her with a body belt and ankle straps and gagging her mouth with thirteen feet of tape. There was a national outcry when people heard how Joy had died. 'Justice Denied ' hears from members of her family about Joy's death, reports on the reactions to it in the Black community, examines two other deaths related to immigration control, that of Kwanele Siziba and Joseph Nnalue, and asks what are the political circumstances that allow these deaths to happen. The film follows the struggle of Joy's family in their fight for justice and for the truth to be exposed. The film examines how the media carried out a character assassination of Joy in order to justify the way in which she was killed and how this fed into a widespread cover-up. TASTING FREEDOM (50 minutes/1994) 'Tasting Freedom' documents the struggles of asylum seekers in Britain for recognition of their basic human rights and investigates abuses on asylum seekers in detention centres and prisons. The documentary gives a startling account of how people who have come to Britain to find freedom are instead persecuted. 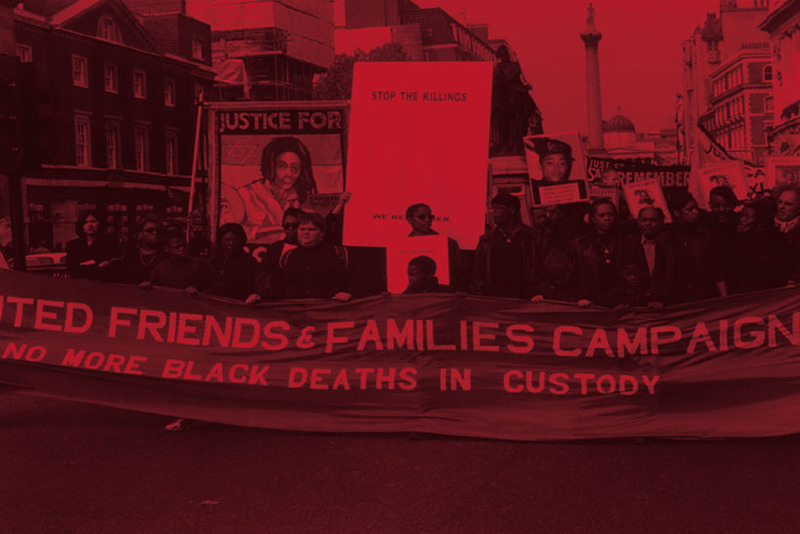 The film contains unprecedented interviews with detainees who speak about the abuses they have suffered under Britain's immigration laws and documents deaths in detention centres and prisons including that of Zairian asylum seeker Omasase Lumumba who was killed by prison officers in Pentonville in 1991. The documentary closely follows the struggles of the detainees including hunger strikes, revolts and uprisings. They give first hand accounts of how they organised themselves during these protests and the measures used by the immigration service to suppress them. Despite being ignored by the media and isolated from the outside world the film documents the courage and determination of people prepared to stand up for their rights even at the cost of their own lives. SWEET FRANCE (52 minutes/1992) In France the control, and exploitation, of immigrants is central to the policies of all political parties and although unemployment is a national problem, people despise the young unemployed immigrants. Social discrimination mixes up with racism and brings hell to the housing estates. Fights take place between the police and the youth. Regularly suburbs across France explode into uprisings when young immigrants are killed by the police. Since the late 70's, young immigrants have organised to fight back, especially the young beur (a slang word for Arab) and the emerging militant "beur movement" achieved some important successes in the early 1980's. This documentary explores this movement by following some of the young people who have been active throughout the last decade, focusing on their lives and activities today. Their parents also speak about their own experience of racism in French society, such as the massacre of over 200 Algerians by police in Paris in October 1961. This combination of the militancy of the youth and the experience of the older generation is now firmly on the political agenda and is challenging the French model of the Republic; "Liberty, Equality, Fraternity" - for whom? AFTER THE STORM(30 mins/1992). When Allied forces launched a war against Iraq in 1991 the Arab community in Britain sat horrified as they witnessed on television the death of innocent civilians and the destruction of a country. 'After The Storm' takes us through the experiences of a settled Arab community of Iraqi, Palestinian and Yemeni children, writers, political activists and steelworkers. It examines how Arabs are attacked and despised in the media and how this is manipulated to sway public opinion in times of war. The programme expresses the pain and anger experienced by the community during the Gulf war. The film also explores the contribution of working class Arabs and political refugees to Britain and their demands and struggles, as a community, are expressed in this film for the first time. BRITAIN'S BLACK LEGACY (45mins/1991) From the 1958 Notting Hill riots and the murder of Kelso Cochrane through to the murder of Rolan Adams in Greenwich in 1991, black communities have fought in the streets and in the courts for the basic human right to live without fear of racial attacks. The film focuses on several cases of self-defence such as the Mangrove 9, the Bradford 12 and the Newham 7 as well as racist murders and community response to incidents such the New Cross Massacre, in 1981, in which thirteen black children were killed and which was followed by The Black Day of Action. The film looks at the question of racist attacks in schools and on how policing of black communities led to revolts and uprisings in all the major towns of Britain during the seventies and eighties. 'Britain's Black Legacy' interweaves a wealth of archive material with personal testimonies from some of those who were centrally involved in those struggles. The film retraces this history of struggle and shows how this legacy of resistance opened up fundamental questions around policing and the entire judicial system in Britain. Finally, the film expresses the need to challenge the current political system through using the lessons learnt from the long history of Black struggles in Britain. GERMANY - THE OTHER STORY (30 mins/1991) Even as the West celebrated the victory of the fall of the Berlin Wall immigrant communities in Germany could foresee a wave of racism unleashed against them. This film explores nationalism, racist murders and the need for self-defence of immigrant communities following unification. 'Germany - The Other Story' focuses on two racist murders - that of a Turkish youth, Ufuk Sahin, in West Germany and of an Angolan worker, Antonio Amadeau, in the East and also includes the case of a Turkish youth, Ayhan Ozturk, who killed a German in self-defence. The film features interviews with the families concerned and reconstructs each case with eye-witness accounts. Germany's black and migrant communities speak out openly about the increasing racism in the 'new' Germany, about how the anti-immigrant policies of the State threatens them and about how they are organising the self-defence of their communities. Winner of Platform Europe Award. Migrant Media's productions are now available on VHS.